With farm sizes growing significantly over the past decade, farmers in Western Australia are pleased with the versatility, powerful performance and comfort of Case IH’s Magnum tractors. Around 500 farmers tested the new Magnum tractors on farms across the state last year, with the smoothness of transmission and smoother ride due to the suspended front axle standing out as key features. “Nearly all of the tractors stocked by our dealers sold out quickly following the demos,” said Tom Parton, Case IH Regional Manager, Western Australia and South Australia. “We knew they would be popular, but the demand exceeded even our expectations. “One of the things that really stood out was the 50 km transmission which is a real bonus for farmers in Western Australia who often need to travel up to 80 km between farms. “Being able to travel at road speed, coupled with the suspended front axle which delivers a smoother ride, has made the Case IH Magnum extremely popular. “In fact, almost 80 per cent of the Magnums sold to farmers in Western Australia were fitted with front wheel suspension at the farmer’s request and this trend looks set to continue. With four models in the series, the Magnum305 boasts a new 9.0L engine with 255 PTO Hp, up to 50% torque rise and 37Hp growth. 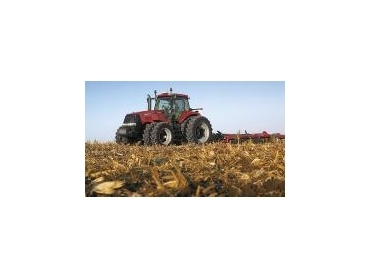 The Magnum215 features 175 PTO Hp; the Magnum245 offers 200 PTO Hp; and the Magnum275 has 225 PTO Hp. The Magnum215, Magnum245 and Magnum275 are powered by an 8.3L, 505 cubic inch engine. The use of biodiesel blends is approved for all Magnum models. Tom Parton added the tractor’s versatility also makes it ideal for Western Australian farming operations. “With features such as auto shift and end-of-row function, the Magnum is ideal for everything from spraying to primary tillage work. When coupled with front dual tyres, the higher horsepower models can easily pull a 36-foot bar when seeding,” he said. The Magnum, with its re-sculpted front end, also boasts the industry’s tight turning radius – 16-feet for standard ‘R34’ tyres – for an MFD tractor on 30-inch rows. The series is available in three easy-to-operate, economical, full Powershift transmission options: a standard 18F/4R speed transmission; a new, optional 19F/4R option with a special 19th gear designed to conserve fuel during transport; as well as a 23F/6R transmission with shift-through creeper speeds. “Our tests have shown that the 19th gear transport option can reduce fuel usage during transport by 11 per cent – that means with just 300 hours of transport, a farmer can more than cover the cost of the feature. Operators can also increase their productivity with the factory-ready AFS AccuGuide autoguidance system, available with multiple accuracy levels to fit every budget and operation. Longer intervals between fluid changes deliver further savings in time and money. With 300 engine hours between oil changes and 1,500 hours between transmission fluid changes, producers require less downtime for service. And if a problem does occur, it can be diagnosed almost immediately because of the tractor’s onboard diagnostics. Case IH offers a range of finance packages for farmers looking to purchase a Magnum tractor, including a special deal where farmers pay nothing for two years on a six-year finance term. “This makes it viable for farmers to upgrade their equipment and capatilise on the increased productivity delivered by Magnum tractors without breaking the bank,” explained Tom Parton.